Today Nick Clegg made a speech setting out the Government’s plans for political reform, at the City & Islington College Centre for Business, Arts and Technology. 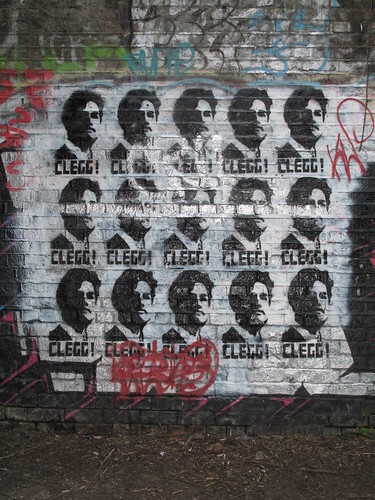 As Iain wrote this morning, the media are viewing Nick Clegg and the Liberal Democrats as revolutionaries, and drawing parallels with the Reform Act 1832. Nick’s speech expands on three more R’s: repealing infringements on freedom, reforming politics and redistributing power. I have spent my whole political life fighting to open up politics. So let me make one thing very clear: This government is going to be unlike any other. This government is going to transform our politics so the state has far less control over you, and you have far more control over the state. This government is going to break up concentrations of power and hand power back to people, because that is how we build a society that is fair. This government is going to persuade you to put your faith in politics once again. I’m not talking about a few new rules for MPs. Not the odd gesture or gimmick to make you feel a bit more involved. I’m talking about the most significant programme of empowerment by a British government since the great reforms of the 19th Century. The biggest shake up of our democracy since 1832, when the Great Reform Act redrew the boundaries of British democracy, for the first time extending the franchise beyond the landed classes. Landmark legislation, from politicians who refused to sit back and do nothing while huge swathes of the population remained helpless against vested interests. Who stood up for the freedom of the many, not the privilege of the few. A spirit this government will draw on as we deliver our programme for political reform: a power revolution. A fundamental resettlement of the relationship between state and citizen that puts you in charge. One: we will repeal all of the intrusive and unnecessary laws that inhibit your freedom. Two: we will reform our politics so it is open, transparent, decent. Three: we will radically redistribute power away from the centre, into your communities, your homes, your hands. Big, sweeping change. Not incremental, not bit by bit. Our democracy has suffered at the hands of encroaching centralisation and secrecy for decades. Take citizens’ rights: eroded by the quiet proliferation of laws that increase surveillance, quash dissent, limit freedom. Take executive authority: consistently increased by successive administrations to the point that we now have a neutered parliament and government that enjoys almost untrammelled control – over precisely the people who are meant to keep it in check. Take the welfare state: one of modern society’s greatest liberators – but now so utterly different to that envisaged by Beveridge, because it has been distorted by the sheer degree of centralised control and micromanagement. Britain was once the cradle of modern democracy. We are now, on some measures, the most centralised country in Europe, bar Malta. So, no, incremental change will not do. It is time for a wholesale, big bang approach to political reform. And that’s what this government will deliver. I’m a liberal. My starting point has always been optimism about people. The view that most people, most of the time, will make the right decisions for themselves and their families. That you know better than I do about how to run your life, your community, the services you use. So this government is going to trust people. We know that, when people see a real opportunity to shape the world they live in, they take it. Just think of the election we’ve just been through. Thousands of young people rushing to register to vote before they missed the deadline. When people have power they use it. We must make sure this never happens again. You must be confident that, come polling day, your voice will be heard. And – more than that – that the chance to be heard doesn’t just come round around once every five years. You should be able to use your voice, exercise your power, every single day. Under this government’s plans, you will. So, three steps to new politics. First, sweeping legislation to restore the hard won liberties that have been taken, one by one, from the British people. This government will end the culture of spying on it’s citizens. It is outrageous that decent, law-abiding people are regularly treated as if they have something to hide. It has to stop. So there will be no ID card scheme. No national identity register, a halt to second generation biometric passports. We won’t hold your internet and email records when there is just no reason to do so. CCTV will be properly regulated, as will the DNA database, with restrictions on the storage of innocent people’s DNA. And Britain must not be a country where our children grow up so used to their liberty being infringed that they accept it without question. There will be no ContactPoint children’s database. Schools will not take children’s fingerprints without even asking their parent’s consent. This will be a government that is proud when British citizens stand up against illegitimate advances of the state. That values debate, that is unafraid of dissent. That’s why we’ll remove limits on the rights to peaceful protest. It’s why we’ll review libel laws so that we can better protect freedom of speech. We will ask you which laws you think should go. Because thousands of criminal offences were created under the previous government; yet taking people’s freedom away didn’t make our streets safer. Obsessive lawmaking simply makes criminals out of ordinary people. So, we’ll get rid of the unnecessary laws, and once they’re gone, they won’t come back. Because we will introduce a mechanism to block pointless new criminal offences. And, we will, of course introduce safeguards to prevent the misuse of anti-terrorism legislation, including a review of existing powers and legislation. There have been too many cases of individuals being denied their rights, and whole communities being placed under suspicion. This government will do better by British justice. Respecting great, British freedoms; which is why we’ll also defend trial by jury. Second, reform of our politics. Reform to reduce the power of political elites, and to drag Westminster into the 21st century. Starting with the House of Lords. Did you know we’ve been talking about reforming the House of Lords for over a hundred and fifty years? It’s one of the areas where all the parties agree. The time for talk is over. This government will replace the House of Lords with an elected second chamber, where members are elected by a proportional voting system. There will be a committee charged specifically with making this happen; but make no mistake: our committee will not be another government talking shop. This will be a dedicated group devoted to kick-starting real reform. The same haste will be applied to fixed-term parliaments. It’s just wrong that governments can play politics with something as important as a general election; cynically picking the date to maximise their own advantage. So this government has already set the date we think the next election should be: May 7th 2015 – no matter who is where in the polls. That is unless parliament votes to dissolve itself first. As we legislate to fix parliamentary terms the details will of course need to be worked out; but we believe that the support of 55% of MPs or more should be required for parliament to opt for an early dissolution. That is a much lower threshold than the two thirds required in the Scottish Parliament. But it strikes the right balance for our parliament: maintaining stability, stopping parties from forcing a dissolution to serve their own interests. Now this last week, former Labour Ministers who were once happy to ride roughshod over our democracy but are now declaring this innovation some sort of outrage are completely missing the point: This is a new right for Parliament, additional to the existing unchanged powers of no confidence. We’re not taking away parliament’s right to throw out government; we’re taking away government’s right to throw out parliament. Parliament’s power will also be strengthened as we bring forward the proposals of the Wright Committee, published in November. Starting with provisions to give MPs much more control over Common’s business. And, in addition to strengthening parliament, we will of course make sure we’ve cleaned it up. Which is why I have already commissioned work on introducing the power of recall. If you’re MP is corrupt, you will be able to sack them. You will need the support of 10% of people living in the constituency, and your MP will have had to have been found guilty of serious wrongdoing. But it happens in Switzerland, in Canada, in 18 US states, and it’s going to happen here. We will regulate lobbying in parliament. It’s wrong to present all lobbying as sleazy. Much of it serves a hugely important democratic function, allowing different organisations and interests to make representations to politicians. But it is a process which must be completely transparent. But let’s get real: this is a £2bn industry, where, according to some estimates there are MPs who are approached by lobbyists a hundred times every week, and that activity needs to be regulated properly. Which we’ll do, for example, by introducing a statutory register of lobbyists. More broadly, as long as money plays such a big part in our politics, we are never going to end the tyranny of vested interests. That’s why David Cameron and I are determined to reform party funding. All of the parties, all of the parties, have had their problems, and governments have been stopping and starting on this issue for years. But so long as big money continues to hollow out our democracy, everybody loses. So we will pursue a detailed agreement on limiting donations and reforming party funding in order to deal with this once and for all. And, in our big clean up, we’ll act to tackle electoral fraud too, speeding up the implementation of individual voter registration. And no programme to reform our political system is complete without reform of our voting system. This government will be putting to you, in a referendum, the choice to introduce a new voting system, called the Alternative Vote. Under that system far more MPs will have to secure support from at least half the people who vote in their constituency, and, hand in hand with that change, there will be new constituency boundaries, reducing the number of MPs overall and creating constituencies that are more equal in size. David Cameron and I are very relaxed about the fact we may be arguing different cases in that referendum. But my position is clear: the current voting system, First Past the Post, is a major block to lasting political change. According to some estimates, it ensures that over half the seats in the Commons are “safe”, giving hundreds of MPs jobs for life, meaning that millions of people see their votes go to waste. Is it any surprise that, with a system like that, we end up with politicians who are seen to be out of touch with the people they serve? New politics needs fairer votes. This referendum will be our opportunity to start to make that happen. The third, and final step, is the redistribution of power away from the centre. It’s something the Prime Minister spoke about yesterday, and it is something we both strongly believe in. All politicians say they want to give people more control over their lives. This government is going to make it happen. In fact, if there is one area, where the differences between Liberal Democrats and Conservatives are almost impossible to spot, it’s here. We don’t, unlike Labour, believe that change in our society must always be forced from the centre. Unlike the previous Labour government, we’re reluctant to relinquish control. So rest assured, you will get more control over the hospitals you use; the schools you send your children too; the homes that are built in your community. In our legislative programme we will be setting out plans to strip away government’s unelected, inefficient quangos; plans to loosen the centralised grip of the Whitehall bureaucracy; plans to disperse power downwards to you instead. And we are serious about giving councils much more power too over the money they use, so they depend less on the whims of Whitehall, and can deliver the services and support their communities need. We know that devolution of power is meaningless without money. Our plans to disperse power also include strengthening devolution to other parts of Britain: Working with Holyrood to implement the recommendations of the Calman Commission; working with the Welsh Assembly on introducing a referendum on the transfer of further powers to Wales; supporting the continued success of the devolved government in Northern Ireland. And, of course, asking what we can do about the difficult issues surrounding the old West Lothian Question. So, the repeal of illiberal laws, the reform of politics, and the redistribution of power. Our very own Great Reform Act. Not everyone will like it. Not every MP, not the vested interests that want government to stay closed, opaque, easily captured. But this new government, this new kind of government, creates an enormous opportunity for those of us who have spent our lives fighting for political reform. This is a moment to step back and look at every bit of damage that has been done to our democracy, before we launch into the most radical programme of reform, empowerment, enfranchisement in over a century. A programme so important to me personally that I will take full responsibility for seeing it through. And as I do, I will be open, I will be ambitious, and I will listen. I’ll still be holding my town hall meetings that I’ve been holding for the last two years around the country, where you can come and ask me whatever you like. The next one is actually in Sheffield on Friday. As I lead the transformation of our political system, I want you to tell me how you want your politics to be. Power will be yours. Read more by Helen Duffett or more about 1832 great reform act, electoral reform or nick clegg. Diversity and representation – instead of whinging, why don’t we do something about it? It is appropriate to point out that when Nick Clegg introduces his proposed Great Reform Act in the House of Commons, he will be following in the footsteps of that other former Westminster School pupil and Liberal Leader, Lord John Russell, who introduced the Great Reform Act in the House of Commons on 1 March 1831. John – Yes that was what I was waiting for too, this is from our manifesto and without this the “Big Society” just could not work! Well I’d hope for something a bit more progressive than a measure that extended the vote to 4% of the population! Disappointed though to see the 55% nonsense restated without any other provision for dissolution. So that’s the first of the unnecessary laws I think should go… oh, hold on, it’s Mr Clegg’s own government that’s proposing to introduce it. And he says “We will ask you which laws you think should go”, but then doesn’t tell us how we’re to be able to make our views known. In the meantime government remains as “closed, opaque and easily captured” as ever. Did anyone watch Alan JOHnsons reply ? Its a useful reminder of why no deal with Labour was possible. No sign of change either. What the 55% rule will do is separate dissolution of parliament from confidence in the government – a PM could still be dumped on a simple majority, but it would require then another government to be formed before dissolution. It’s the same in Scotland, where the First Minister must be elected by the Parliament within a certain timeframe. What’s missing from this proposal is a timeframe for a new government, though. If a Govt. lost the confidence of the House, then a new one would need to be formed – but what if that doesn’t happen? btw, as a historical aside, do mainstream Lords reform proposals go back “over 150 years”? I thought it only became an issue after the 1893 Home Rule defeat, which left even Gladstone reluctant to act against the then Tory veto. Am I missing something earlier? You think that Parliament should not have the power to dissolve itself? That this power should be the exclusive right of the Prime Minister and the crown? What’s missing from this proposal is a timeframe for a new government, though. You’re looking at a speech, not a proposal. Wait for the bill to show up before analysing the details. It’ll cover a whole bunch of corner cases like this – and if that one is missing, it can get added during the usual progress of the bill through Parliament. That is what we have the parliamentary process for. See here: http://www.opendemocracy.net/ourkingdom/mike-rustin/after-neo-liberalism-in-britain, and my first comment on an entirely complementary conservative, liberal and social democratic way to ‘populate’ decentralisation. Aye ours of, by and for the peoples everywhere. In a word, no. Most of that money goes directly to supporting the agriculture that supplies your food. If it didn’t go there, you’d just get higher prices. At best, nothing would change; if corporate greed overcame long-term planning, we could have shortages and huge extra import costs. Preventing that sort of thing from happening is one of the primary reasons why we have an EU. This may be technically correct, but it’s a bit disingenuous, I think, because there’s no doubt that under the current rules the expectation after a vote of no confidence is that parliament would be dissolved. It’s good that he’s indicating the details have yet to be worked out, but bad that he repeats the 55% figure, because in most parliaments (including the present one), that won’t “[stop] parties from forcing a dissolution to serve their own interests”. err, while there is some good stuff in here, from a purely historical prospective it can hardly compare with the 1918 Representation of the People Act. Unlike the previous Labour government, we’re reluctant to relinquish control. I think it’s a great speech — a lot of the reasons I voted LibDem. I did see one question left un-addressed — how will we deal with the erosion of civil liberties for the visitors, students and *legal* immigrants we invite to join our society. Anthony A S – I think it’s important to realise exactly why fixed term parliaments have been so high on the agenda – they were always needed but the urgency is striking. In a coalition under FPTP it would be very easy for the PM’s party to form a coalition, spend lots of money in a few marginal seats and then call another election. The fixed term parliament and 55% requirement are essentially to protect the Lib Dems from a “faithless” coalition. Of course, it would still be possible for Labour and the Tories to band together to call an early election but not even the 2/3 rule would prevent that. The idea is that parliaments will be fixed and that only in the event of a hung parliament where a government falls and another cannot be formed could an election be called early and only with a concensus in the House. John E – I am an ardent devolutionist but even I would have voted No in the North East referendum. The reason being that devolution was not what was being offered. The Prescott Plan for regional assemblies would not have involved any powers being transferred from Whitehall to the region, just from local councils and regional quangos to the assembly. It would also have meant Durham and Northumberland being forced to go unitary which was not terribly popular – though this of course subsequently happened anyway. This 55% business is becoming more and more preposterous. You’ve now stopped arguing that it’s “in the public interest” and admitted that it is simply to “protect the lib dems”. Self serving gerrymandering, a shining example of “the new politics” in action. Does it not worry any of you that “the new politics” is simply the lib dem equivalent of “new labour”. Good looking guy with a nice smile in a well cut suit surrounded by a cabal of cronies hijacks a once proud party and drives it remorselessly to the right, so that pretty soon nobody knows what it stands for and all principles are consumed by “the project”. I think we’ve been here before and it ends in tears. I understand the principle of a “supermajority”, and have been defending it on other threads. However, I do not think setting it as low as 55% is defensible. As you say, it is still possible for the coalition to call an early election, and- if you check the numbers, you’ll find that would _not_ be possible if the threshold were 2/3 – it would be possible only with the largest of landslide majorities. In a sense this proposal leaves us with the worst of both worlds. A simple vote of no confidence can no longer trigger a dissolution, but the prime minister still has the power to choose the date of the election. Or should that be “Two good-looking guys with nice smiles in well-cut suits surrounded by cabals of cronies hijack two once-proud parties and drive them remorselessly to the centre-right …”? “Or should that be ‘Two good-looking guys with nice smiles in well-cut suits surrounded by cabals of cronies hijack two once-proud parties and drive them remorselessly to the centre-right …’? Or should that be three? While each hoping to draw supporters from one or more of the others because… I forget. I warning you, it’ll end in tears. But then it always does…….